How Far is VGN Krona Phase II? VGN Krona Phase II, a residential project developed by VGN Developers Private Limited located in Gerugambakkam. 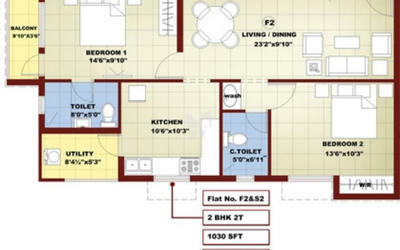 These Ready to occupy apartments in Gerugambakkam comes with two different dimensions 2BHK and 3BHK. 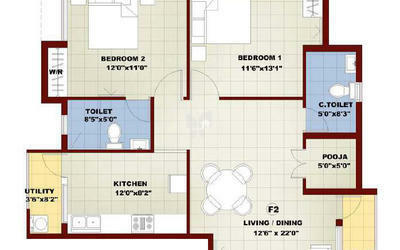 These homes are designed to provide better living experience with a lifestyle to the occupants. The project is spread across acres and offers apartments for sale in Gerugambakkam, the size of 2BHK apartments is 1030 Sq ft, 1260 Sq ft and the size of 3BHK apartments is 1225 Sq ft, 2000 Sq ft. Come and be a part of this amazing project and experience the elegance. VGN Krona Phase II is located in Gerugambakkam, one of the developing areas in the locality. Being residents of this locality, you can enjoy many location advantages, as you will stay close to well-known educational Institutions, health care units and to shopping areas, entertainment zones, in addition to this the locality is well connected by road and rail, even airport is also there in the vicinity. Along with apartments in Gerugambakkam VGN Krona Phase II offers many useful amenities for the benefit of the residents, some of them are Swimming Pool, Clubhouse, Multi-purpose Hall, Home Theatre, Parking, Children's Play Area, Library, Gym, Tennis Court and Indoor Games. Ceiling fan point – 1 No. Chandelier point – 1 No. 6A socket – 2 Nos. TV point + 6A socket – 1 No. Telephone point + 6A socket – 1 No. AC point – 1 No. Fridge point – 1 No. 16A socket (Washing machine) – 1 No. Shaver socket – 1 No. Mirror light – 1 No. Wall light point (2 way control) – 1 No. Ceiling fan point (2 way control) – 1 No. Wall lamp point – 1 No. 25A socket (Split AC) – 1 No. 6A socket – 3 Nos. 16A socket – 1 No. Exhaust point – 1 No.